View my other posts in the series: When Artists Cook. 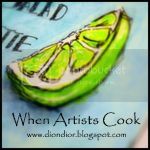 I was recently invited to participate in an online series of articles by artists, focusing on how our artistic processes interact with how we cook and think about food. Created and curated by Australian-expat artist Dion Dior, the series will be an on-going exploration of how art and food play key roles in our lives. I came of age in a series of Montana kitchens and gardens, though I recognize this largely in retrospect. My childhood had a yellowish-glow, due to the overwhelmingly vibrant 1960s-era styling of my parents’ kitchen. Working in the family garden, picking off potato bugs and harvesting potatoes, and canning peaches and tomatoes with my mother gave way to flipping eggs on the flat grill at the local greasy spoon. Eventually, I became aware of major food system issues, and became dedicated to local and organic foods as only a college-age kid can chose a cause. I majored in a combination of sustainable food, natural history, and studio arts, with a hefty helping of writing and literature on the side. I re-taught myself how to can seasonal produce, dug my fingers deep into the fertile realm of organic gardening, and developed a tradition of baking bread weekly with my mother while home each summer. I tried to phase out plastic in my life, and immersed myself completely in the local foodsheds of my hometown and university town. And...I made my loving family crazy!
. . . Keep reading . . . THIS ARTICLE & ILLUSTRATIONS ARE GREAT!!!! !